south Mumbai area. Its a old Monument Temple, It is named as ‘Mumba’ means Mumbai and ‘Devi’ means goddess so named ‘mumbadevi’. Its a an oldest and famous place of worship for hindus. Here in rituals they offer coconut, flowers, agarbatti (Scented Sticks) and sweets (prasad) to goddess and Pray for their needs. 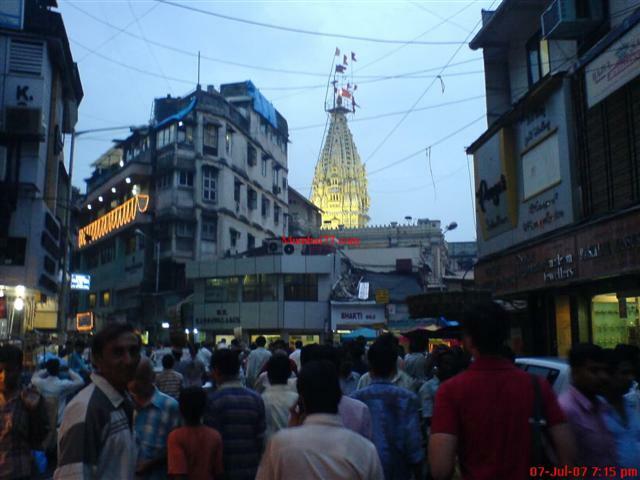 This place is located at one of the most crowded location/market business place of Mumbai known as Bhuleshwar. Its a 10 mins walkable distance from Charni Road Station (East), or alternately you can take a cab/taxi from same to other Station like Churchgate/marine drive. Famous For and You will enjoy the Aarti’s that are performed in evening at 7:30 pm and also in early morning, this are special prayers for goddess, also you will find lots of other Murtis (idols) of other gods believed by Hindu community. If you really want to see crowd and Rush markets of Mumbai you should go walking here. During Navratri and other festive seasons ‘Ghatasthapana’ is done and 7:00 am with other rituals and aarti. People comes in lakh to take darshan as first day of navratri is considered as start of good days. Zaveri bazaar (Place for jewellery market), Princess street, Bhuleshwar market for beautiful ornaments for every occasion, C P tank market, Crawford market.